GOLD PRICE fell $4.50 (0.4%) to $1,204.40, trading in the tightest range, silver rose 1.9 cents (0.11%) to $17.111 when Comex closed. SILVER PRICE ranged today from $17.16 to $17.00, while gold traded from $1,200.8 to $1,212.40 — mighty tight ranges. That leads me to suspect finely balanced buying & selling pressure. Something will happen to push them over the edge, up or down. So far they’re clinging to that $17.00 and $1,200 support. Today was simply inconclusive. Silver & GOLD PRICES didn’t break down, but neither did they rise. Holding on here is strong, but when you are a market in a downtrend, everybody doubts your word. Be patient. A friend pointed out to me something I overlooked yesterday in the story of the 5 megabanks fined for criminal market manipulation: the corporation didn’t even pay the fine. The poor hapless stockholders are paying the fine, not the corporation or the corporate officers, even though the corporation writes the check, it comes out of the stockholders’ pockets. The corporation, and the perpetrators, got off scot-free. Behold, what do you say about a market that spurts up and down all day, only to close a mere 0.34 higher? That was the Dow, after a high at 18,314.89 closing at 18,285.74. S&P500 closed at another new barely-high, up 4.97 (0.23%) to 2,130.82. Dow in silver hooked down 0.32% to end at S$1,377.75 (1,065.60 troy oz), about S$39 (30 oz) above its 200 DMA. Dow in gold jigged up 0.25% to G$313.38 (15.16 oz). When they come down, they’ll come down hard. The jaws of the gator grind slow, but they grind exceeding fine. Today ’twas almost as if the market looked at yesterday, shook its head, & moved the other way. US dollar index’ backwards move yesterday was corrected with an 18 basis point (0.19%) tumble to 95.33. 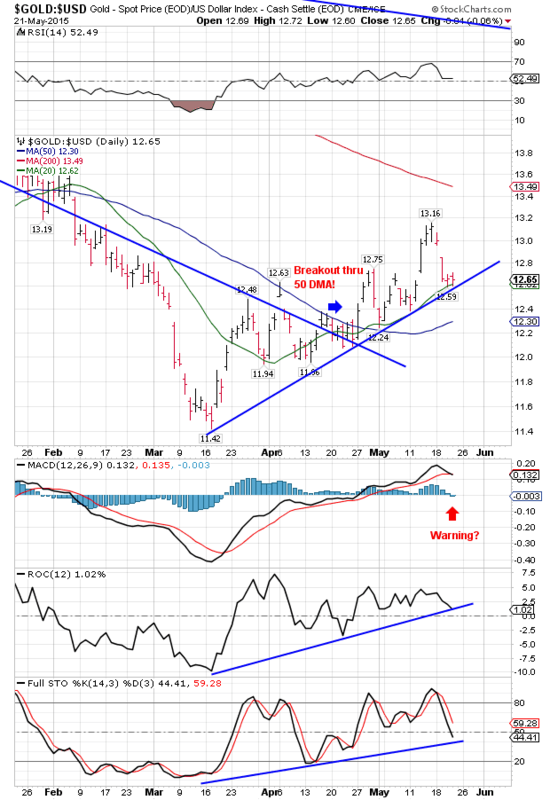 Most likely that signals the dollar’s upward flight done run out of gas. You got to walk a piece and sift a lot to find a currency as sorry & scared as the euro. Yesterday it spent the day below its 20 DMA, and although it rose 0.21% today to close at $1.1117, it’s still down there. And below the uptrend line of what promised MIGHT be a rally. Nasty thing wants to sink more. The Japanese yen smells no better. Yesterday it hit the bottom of it 6 month trading range, & today it stuck a nose out of its mouse hole but decided there might be too many cats to risk it. Rose 0.29% to 82.64. Interest rates caught up, too. Yield on both the 10 year Treasury note & the 30 year bond fell, but both remain ABOVE their 200 DMAs. WTIC rose 3.27% to $60.68. It waked through its uptrend line two weeks ago, but so far has refused to stay below its 20 DMA. Copper rose 0.78% today to $2.85, but it broke down through its 200 DMA three days ago, & is destined for lower things. Call it what you will, that world, that network, that mindset is still alive and well, & keeps the world working. Look for those folks, and you can not only find them, you can join them — and rejoice. The free state survives.